What is the best way to see Stage 3 of the 2015 USA Pro Challenge as a fan? Combing all the great resources to help you have a great day at the race - this easy one-page guide is intended to help locals and tourists better plan for watching Stage 3 in Copper Mountain Resort and Aspen, Colorado. I am very excited to see Copper Mountain as a host city for the first time in five years of this race. 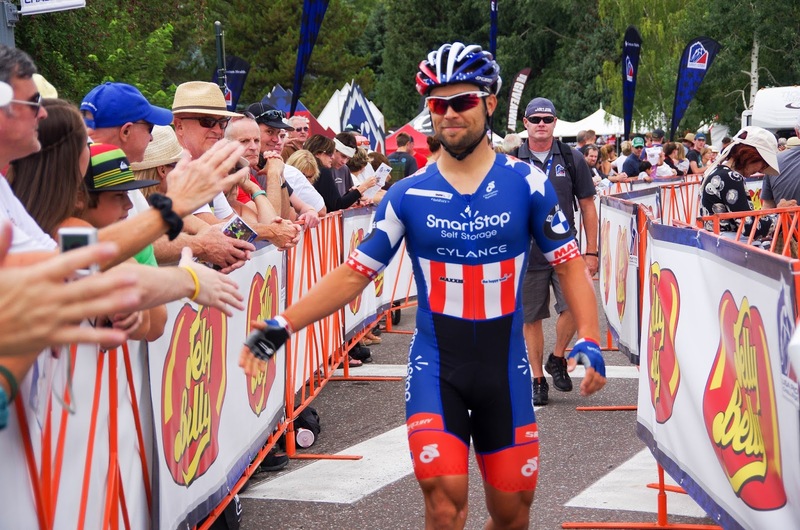 Find what you need to know about Stage 3 of the USA Pro Challenge in Coper Mountain and Aspen, below in the following order: Stage 3 dates, stage information, start time, finish time, sprint location, KOM location, classification Jerseys, route map, climb profiles, race organization, city tourism, town websites, local events, road closures, VIP tickets, apparel, TV coverage, Tour Tracker app, media coverage, stage preview, recommendations, where to ride, results, current standings and photos. 1.5 hour before start, near the team buses and sign-in podium, are great places for pro rider autographs and see the bikes. 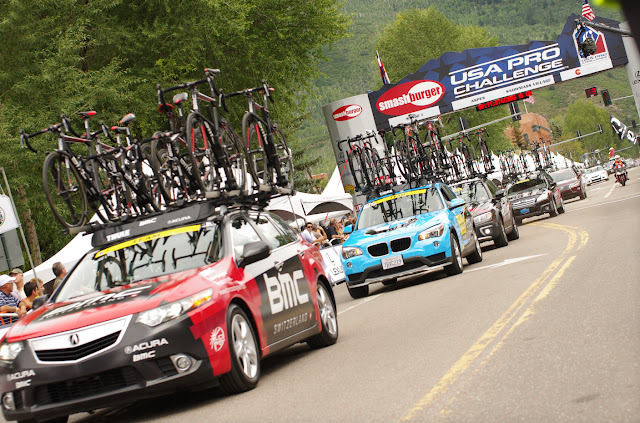 START LOUNGE VIP Hospitality opens 9:40 a.m.
All public parking will be in the Alpine and Far East Lots with the last shuttle prior to start at 10:30 a.m.
Podium Presentation, at the stage in the park, typically 15-minutes after leaders of the stage finish. Turquoise Lake Rd closure 12:00-1:00 pm. Independence Pass closes at 1:00 pm, reopens at 5:30 pm. Look for a small group of breakaway climbers to establish an early lead over Fremont Pass, with rouleurs (riders who likes all types of terrain) to shed a few more with their increased speed toward Independence Pass. 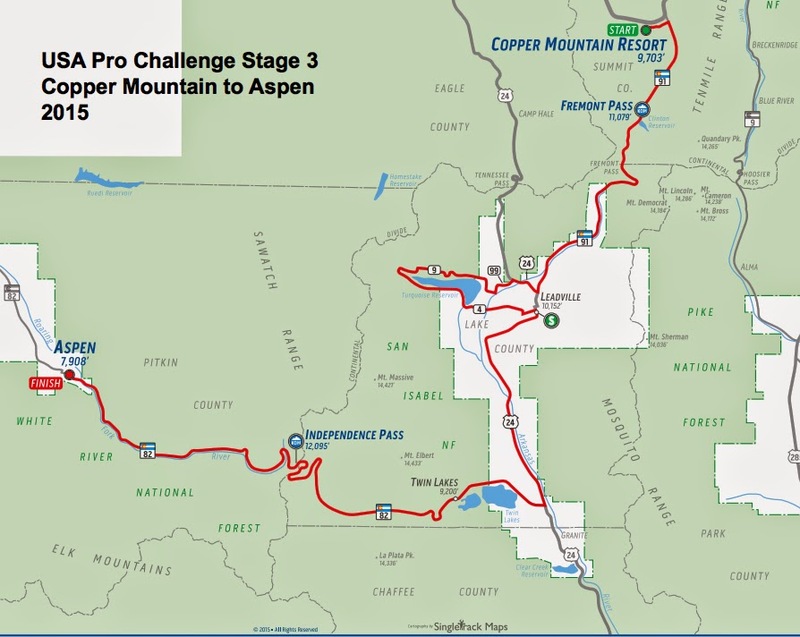 We might see the winner establish a gap by the final mile up to the summit, and down the descent into Aspen, to win Stage 3. 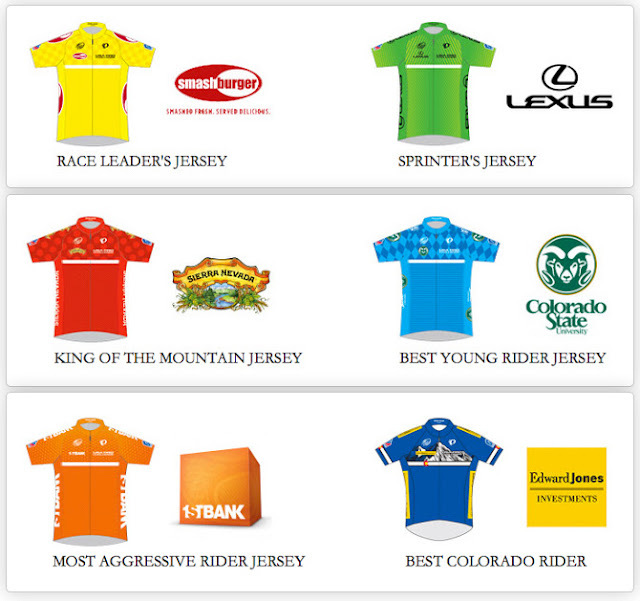 I am looking forward to seeing who is in both the yellow and the best Colorado jersey after today's stage. 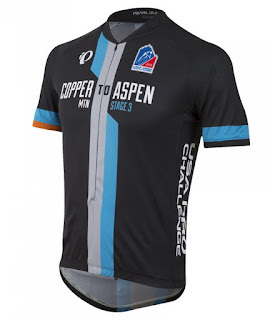 STAGE 3 - Copper Mountain to Aspen - high elevation! 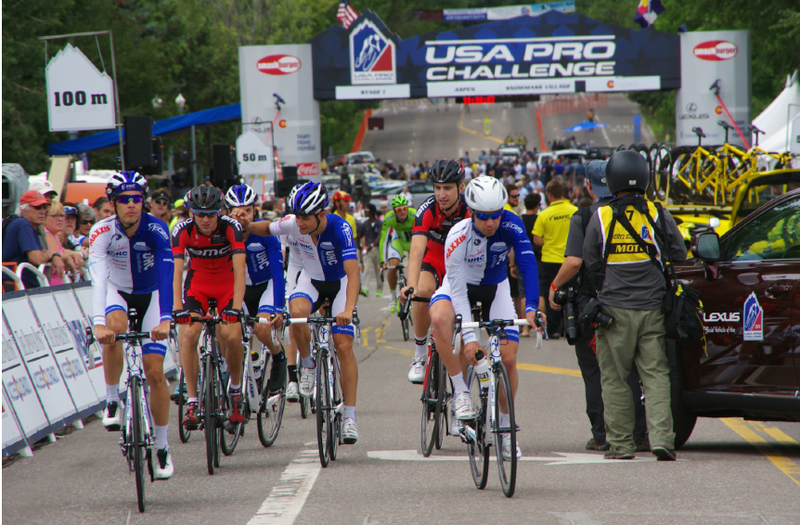 This will be an exciting stage as stage 3 is a quintessential Colorado cycling stage. This path has never been exactly covered in the race's five year history. When you look closel,y you realize the peloton has a hard day in the saddle ahead of them. 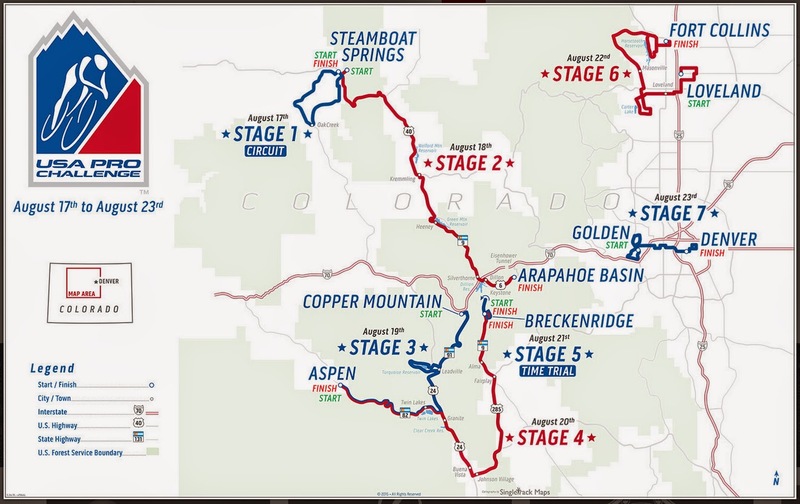 I expect a few riders to withdraw by or on Stage 3, a course over pure Colorado cycling. 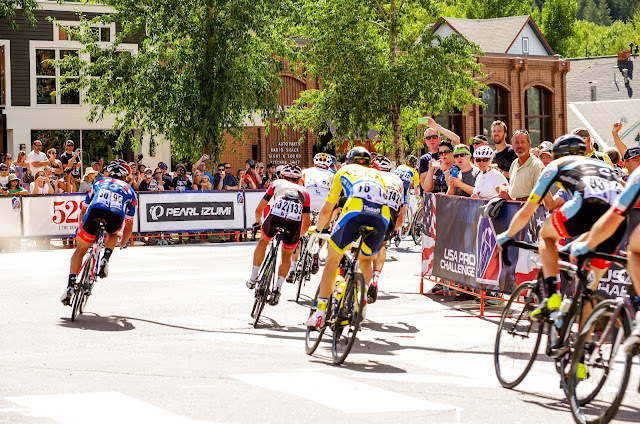 The stage begins in the beautiful Copper Mountain Resort and quickly climbs Fremont Pass (familiar to Copper Triangle cyclists) to the old mining town of Leadville (sight of the famous Leadville 100 mountain bike race). Making a loop around Turquoise Lake (in the heart of trail runs and 10th Mountain Division Huts), the peloton clears Leadville outskirts on their way past scenic Twin Lakes. 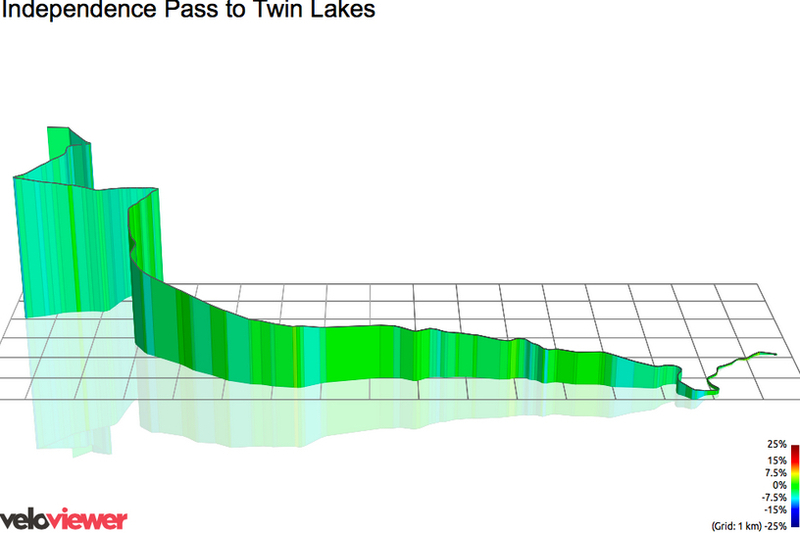 Oh how the climb over Independence Pass will hurt, and decide this stage. Many of the pro riders know this pass very well and have raced to its heights (12,096 ft) in previous editions of the USA Pro Challenge (and will again be required to race it twice this year). All GC contenders will have to finish within the top 15 to the line on today's stage. I am so curious to see who those riders are. Highlights: First-time host city start at Copper Mountain Village, climb of Fremont Pass, Loop around Turquoise Lake, sprint in Leadville, climb over Independence Pass, finish in Aspen. Fremont Pass: Distance (miles): 11.4, Grade (avg. ): 2.7%; max 7%, Ascent (ft): 1618, Max elevation (ft):11318. 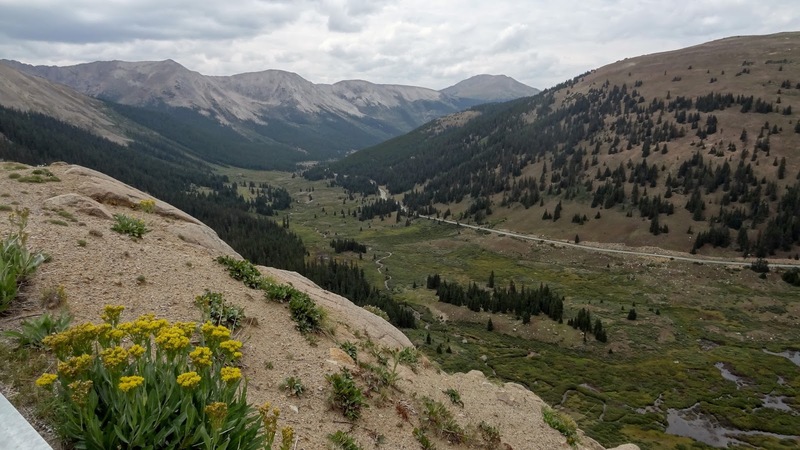 Independence Pass: Distance (miles): 17.1, Grade (avg. ): 3.2%; max 7%, Ascent (ft): 2883, Max elevation (ft): 12095. The initial long descent down Independence Pass to Aspen is fast, but then it gets VERY tight and technical before entering downtown Aspen. 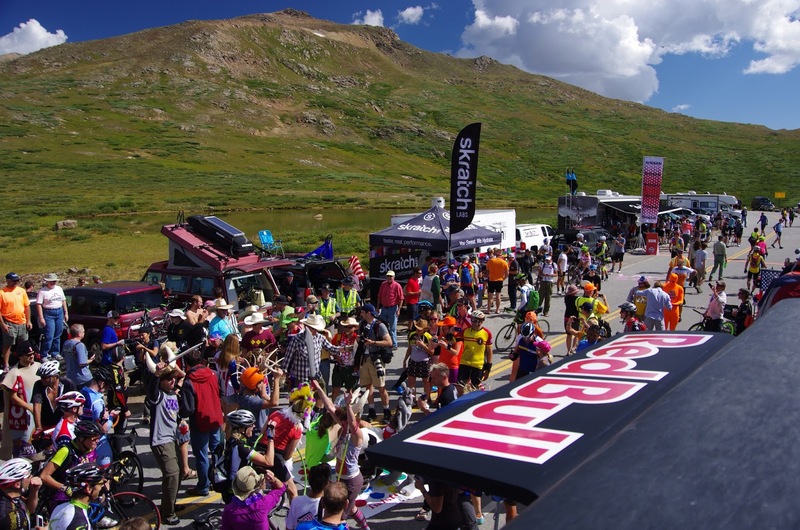 7:00-9:30 p.m. - At COPPER MOUNTAIN, Rider's Lounge: eat and meet riders and announcers. More information. 11:30-5:30 pm - VIP Tent open right on the finish line. Paepcke Park. 1:00 pm - Independence Pass closes in both directions; reopens at 5:30 pm. 2:15 pm - Maxxis Stunt Show Main Street (in front of the VIP tent and the Festival). Awards Ceremony on the Festival Stage! Immediately following the race finish! At Copper Village - all public parking will be in the Alpine and Far East Lots with the last shuttle prior to start at 10:30 a.m. Independence Pass closes in both directions at 1:00 pm; reopens at 5:30 pm. 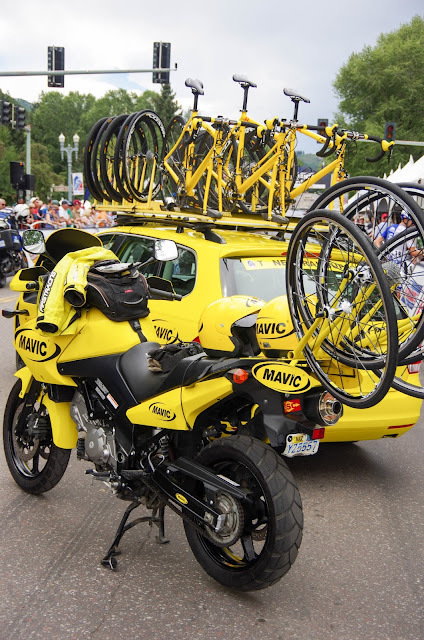 Tip#2: Show up at least 1.5 hours before the stage start to see the riders near their teams buses. Some riders might be cycling to the start of today's stage, rather then driving, but all riders must sign-in at the stage. This is a good time to hear Dave and Brad briefly interview some of the riders. Tip #3: Rider sign-in begins 10:15 am at Burning Stones Plaza. Stage 3 Start is in in Center Village at 11:15 am. Tip #4: Bring something to autograph (and two sharpies! ), just in case you catch a rider at a team bus or on his way to or from the sing-in stage. Tip #5: Use your Tour Tracker app, or bring a print out of he startlist, so you can identify a rider by his dossard (bib number). Read more about dossards: Word of the Day: Dossard by Pedal Dancer®. Tip #6: If you plan to chase the race to Aspen, think about easy exit before you park your car at the start. Within 15-minutes, all team and race vehicles will have moved out. Tip #7: Great bike riding in the area. Consider riding after the stage starts and returning for music and watching the stage finish on the big screens from 2-4pm. 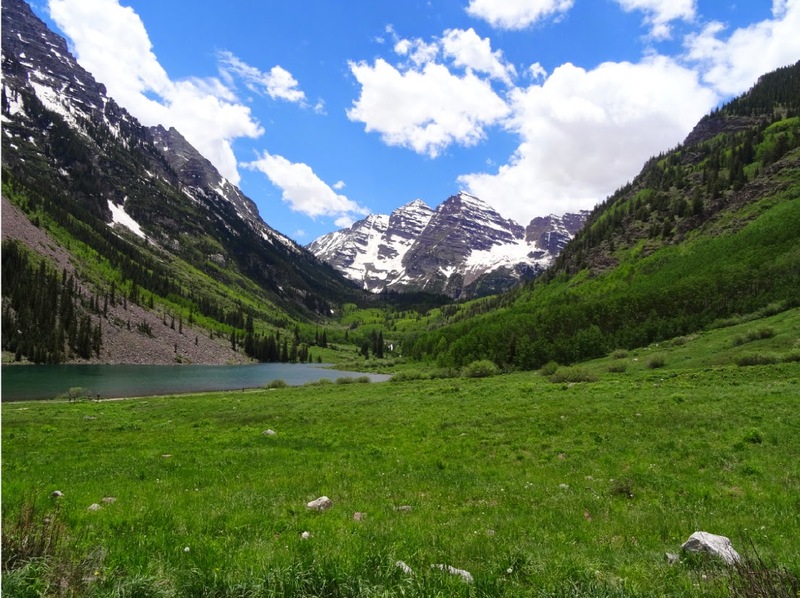 Tip#1: you have a great opportunity to see the riders pass twice, before and after Turquoise Lake. The key will be getting on this stretch of roads prior to road closure. Tip #2: The Feedzone will be between Leadville and Twin Lakes. Feedzone locations are never advertised (for rider safety) but will be signed by the morning. Tip #1: Ride your bike up the pass, unless your costume is so heavy that you must drive. Independence Pass closes at 1:00 pm, reopens at 5:30 pm. 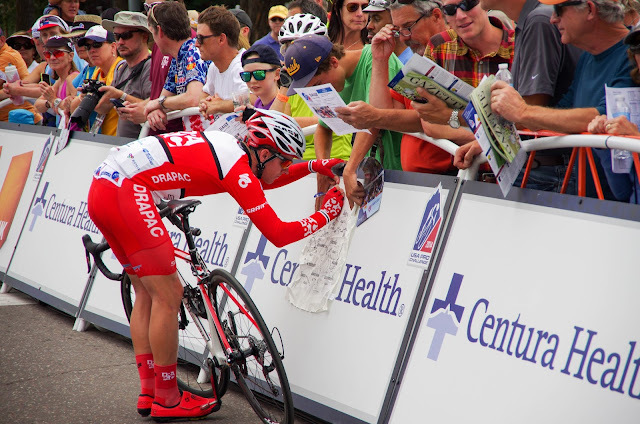 Tip#3: Keep track of the race on your Tour Tracker app or watch on the Big screen TV starting at 2:00pm. 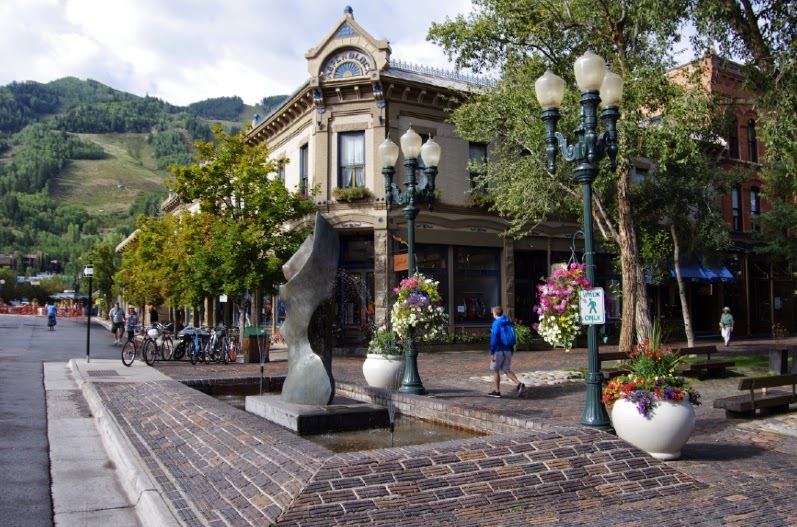 Tip #3: Aspen Podium Presentation will be in Paepcke Park, on the stage near the Finish Festival, (not the announcement stage on Main Street near the finish line). 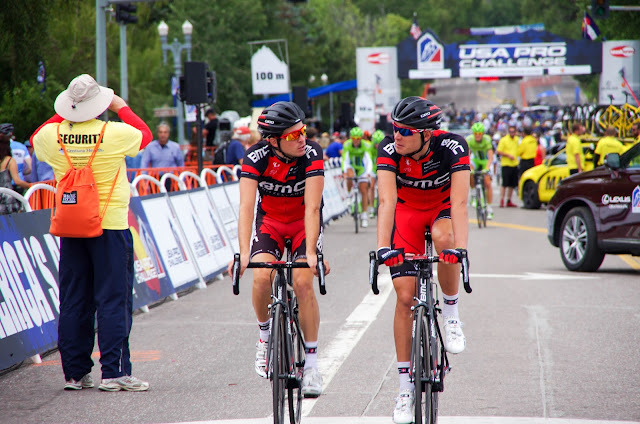 Tip #4: If you are deciding between a VIP Pass for the Finish of Stage 3 in Aspen, or the start of Stage 4 in Aspen, I would go for the start of Stage 4 (unless you are simply partying with your friends all day before the finish!). Although you won't be much in the mood for beer or wine in the morning, you will have a much better view of the riders during the start. You will get to see them roll to and from sign-in and line up for the start. For the finish of Stage 3 line up on the blocks before the tent begins to see a good view. The finish is so quick you will not see as much. Plus the awards stage (podium presentation) is a walk away from the VIP tent anyway. Tip #5: Beer! I only recommend restaurants when I have had a great experience. 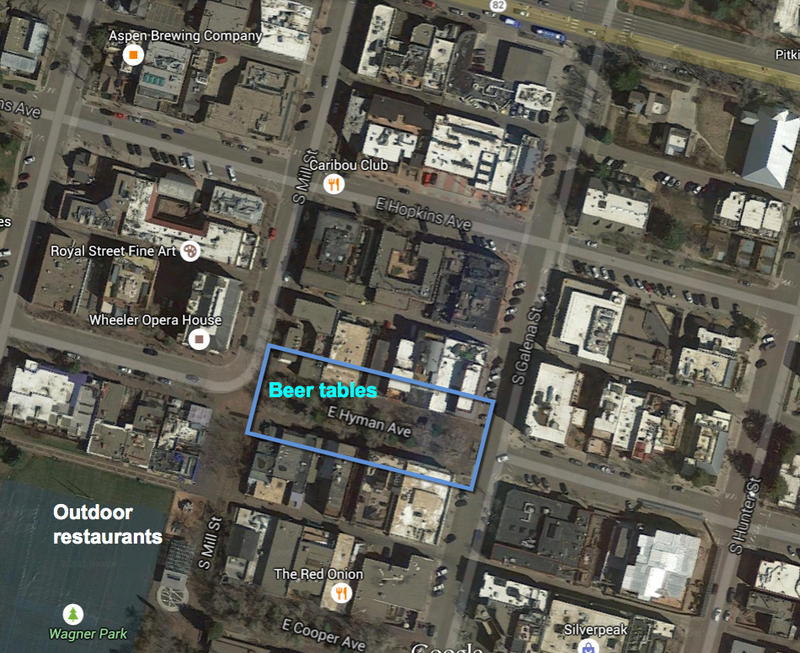 Last year after a stage in Aspen, I had a great experience with friends (Bicycle Colorado crew) having a beer on the outside tables on Hyman St. (pedestrian only street). Sit at the picnic tables in the middle and order beer and food from the fast running waiters. We ate at Hops Culture: 414 E Hyman Ave, Aspen. Lots of fun with Phil & Paul sitting nearby. Beer outside in Aspen, a great setting for a cool one.